There is no need to read between the lines to spot the total dominance of the giant tech companies in our latest study about apps and social media usage. Among other things, we take a look at the app loyalty and across the US, UK and Nordic countries, Facebook is the clear number one. Not only with the Facebook app itself, but also when taking its subsidiary companies like Instagram and WhatsApp into account. 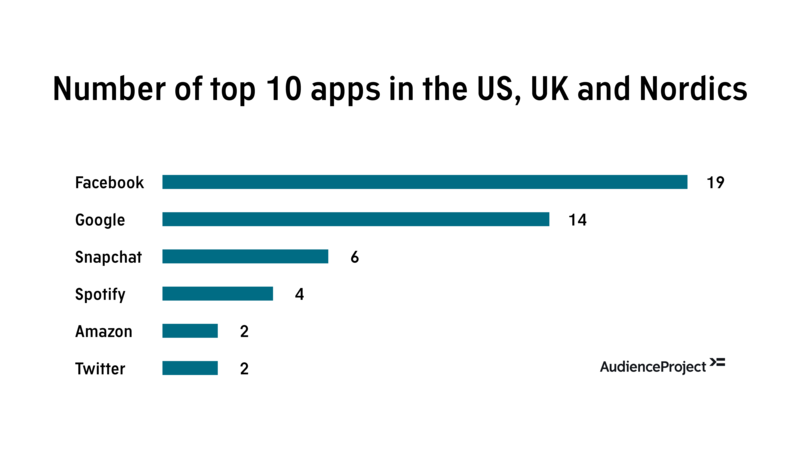 On average, Facebook apps take up more than three spots in each of the top ten apps in the six countries. Not surprisingly, Google comes in second with its wide range of apps (in the top tens mainly with Google Maps, Chrome and Gmail). In total, the tech companies Facebook, Google and Snapchat take up 65% of the spots across all top lists. On the other hand, the different local apps are having a hard time, where weather and finance apps are the only real competitors in the top tens. There are obvious differences though. Amazon and eBay are prominent in the US and UK, but nowhere near the top in the Nordics. And while there are no finance or mobile payment apps in the top ten apps in both the US, UK and Finland, the picture is different in Denmark, Norway and especially Sweden, where BankID is the number one app tilting Facebook from the top spot. 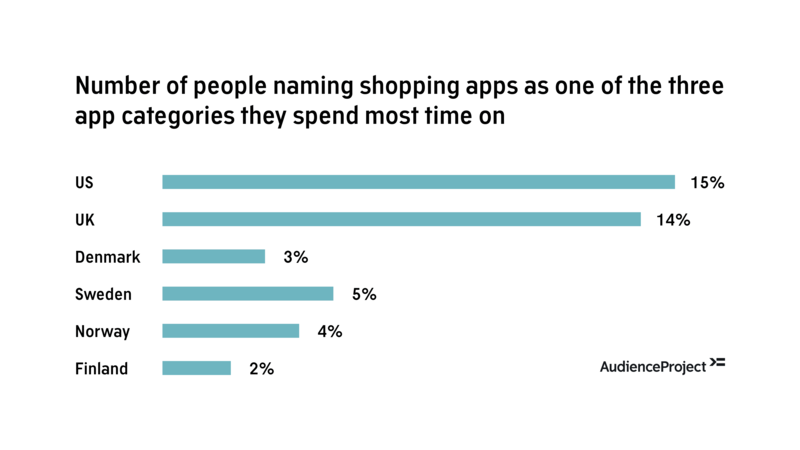 With the presence of especially Amazon in the US and UK, people in general are more inclined towards spending time in shopping apps. In the study below you can learn more about the apps and social media usage in the US, UK and Nordics. Enjoy!